Hey guys! 4 days of school in and I'm feeling like we're off to a good start. Not going to lie, after setting up my classroom the last couple of weeks, I was about ready to call it quits and find a new career :) but then the students came and I remembered I actually love my job!! This year I'm teaching a language arts/math block for two and a half hours in the morning, two sections of fine arts, and then a resource with the same students I have in the morning. As I mentioned at the end of last year, the students I have in the morning are very different from the students I had last year, but, as far as I can see now, I think it will be a good change! Since I have so many 1:1 aides in my classroom, I decided not to do hardly any whole group instruction, but have my students rotate through centers. There is just one student without an aide, so I usually have him work in a pair, or have an aide multi-task if their student is doing independent work tasks. We do start with a "morning class" for the first 10 minutes of class where the students take turns greeting each other - but that's it! Are you thinking, holy cow that's a lot to organize? :) Well, I'm trying to turn over a new organization leaf and here's what I came up with. You can see below my "master student schedules" - for myself and my aides, this is where I have the times listed and the name of the activity that each student should be doing. Then, I have a description of what each activity is, where it happens, and what they should be doing. 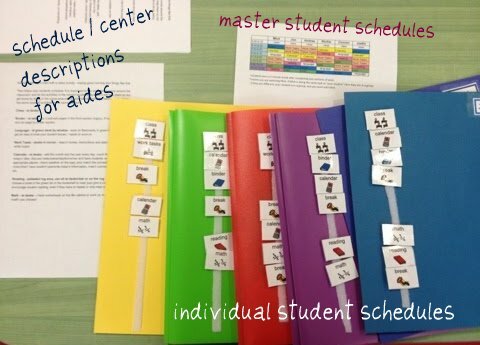 Finally, the students schedules are made with symbols from board maker and ordered on a strip of Velcro on a folder. My "master" schedules - changes depending on the late of the week due to social communication group, school store, late starts, and other random events. Language - at green desk by window - work on flashcards in green bin in the area, get an idea of what your student knows / needs to work on. This will later become discrete trial training section/IEP goal. Calendar - at desks - Add the month and the year every day. Count the dates, add today’s date. discuss today/yesterday/tomorrow and have students velcro in the appropriate places. Check weather on the ipad, and match the symbol. Finished and have more time? Have student type/write today’s information, match symbols, count numbers, etc. Reading - polkadot rug area, can sit at desk/chair or on the rug - have student choose a book in the green bin (simple readers/adapted books - NOT the Story Reader!) in the bookshelf to read (just give a couple choices). Encourage student reading, even if they have to repeat or only read occasional words. Math - at desks - I have worksheets on the file cabinets. Practice money naming, counting, sorting. Will give more instruction as I have time. Update: See some of my instructions for my aides on some of these activities here. I'll plan on sharing more pictures of my classroom and the activities that I have going on during this morning block hopefully soon as I better figure them out :) I spent a lot of time this summer on Sasha's blog, The Autism Helper - so quite a few of my ideas come from her! How about the rest of you? Have you started yet? How did it go? Or are you still setting up your classroom? Can't wait to hear all about it. 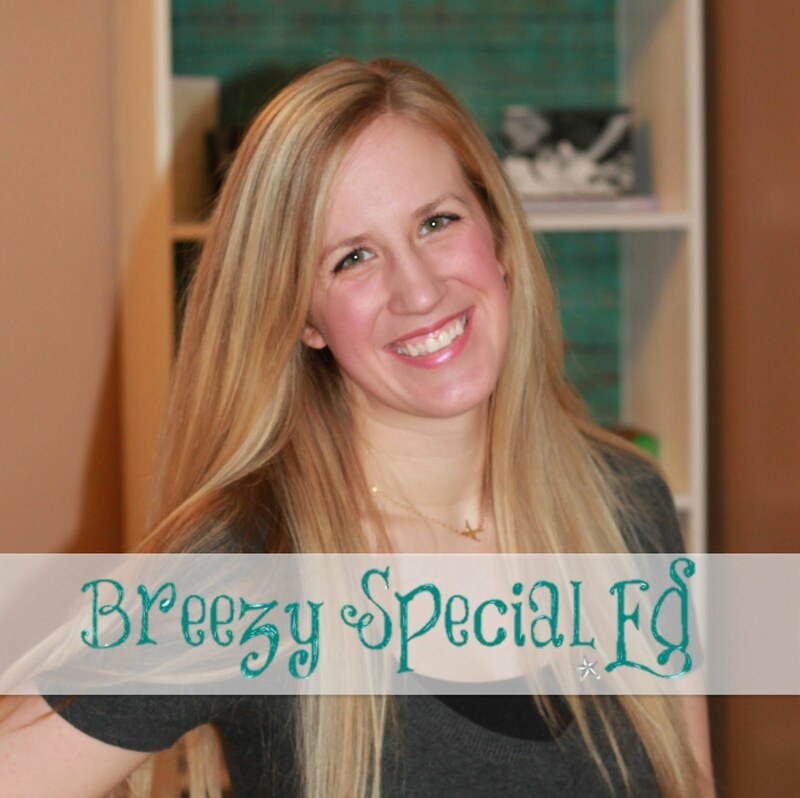 Be sure to leave your blog lovin' link in the comments so I can be sure to follow you! I am still setting up my classroom. I will be teaching a brand new autism program in my middle school in the fall, and I also have been spending a ton of time on the Autism Helper, as well as Autism Tank, Autism Classroom News, and Adventures of room 83. Thank god for those blogs! I am also doing centers but I have my kiddos all day, with the exception of one student that will be mainstreamed for math, and all will go to PE. I wasn't able to really see the photo you shared of your schedules. I would love to see them, just to give me an idea of what other people are doing. Adaptation is my middle name. I'm into the third week of school, and second week of a somewhat regular routine with my students. I really would love to do more of a centers based classroom, but without any extra assistance it might be hard to do. I like the idea of making some notes for the assistants! Thanks for linking up! I hope you will do so in the future. You always have great things to share! Do you have the schedule pieces on your TPT store? I would love to purchase those. Please email sarahcook2285@yahoo.com! Love your site btw. 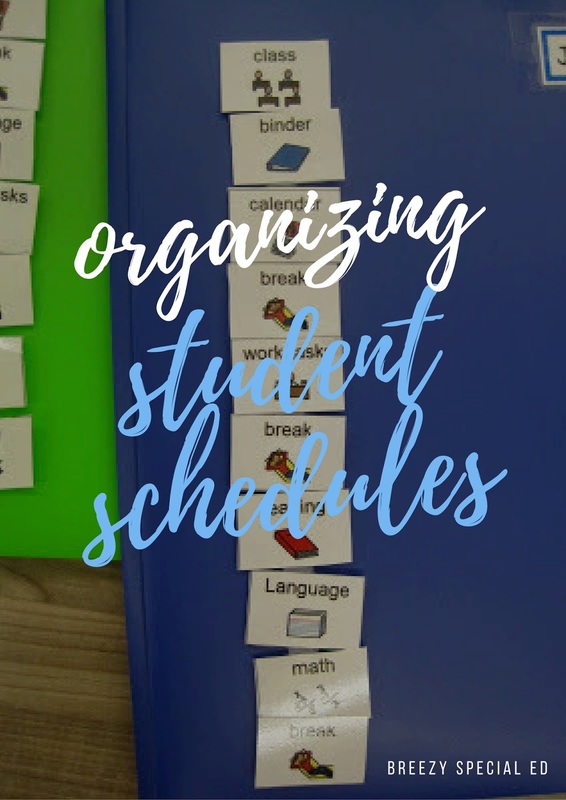 I am beginning my first year as a self-contained high school teacher in August and your posts have given me much needed guidance when it comes to scheduling and organizing my classroom. Thank you for that! She used the board maker software to make the pictures. I have purchased the program for myself because I used to have to share within the district and never had the disk when I needed it. If you teach an autism or self contained class try to get your district to purchase it. It is definitely a life saver and a must in these programs. Not sure if you still keep all your extra pictures in that container. Years ago I went to home depot or lowes..I can't remember which and bought an organizer for nuts and bolts. It has little plastic drawers that come out and are perfect for storing extra pictures. Super helpful for when you need to find a replacement picture quickly.